All eleven-year-old Jared St. George can think about is making his school basketball team. What Jared refuses to think about is math, and the fact that he's failing it. Jared's only hope is peer tutoring from Ellie Brejovic, the weirdo classmate whom everyone shuns. To his surprise, Ellie makes math make sense. But when his mark improves, Jared would rather tell people he's been cheating than let the guys find out about her. Turns out that's the really big mistake, one that could cost Jared not just a spot on the team, but something far more valuable. QUESTION: Basketball and math don't have much in common. How did you happen to write a novel about both of these? 2) What does this character want more than anything else? 3) How can I keep him or her from getting it, at least for a little while? Once I have the answers to all these questions, I know I have a story. When I first began thinking about writing One on One, I took a long time getting to know Jared, and it soon became clear to me that basketball was one of the most important things in his life, so it wasn't hard to understand what he wanted most—to make his school's basketball team. Figuring out how to keep him from getting it led me to think of the kinds of things—besides lack of skill—that keep people from making a school team, and doing poorly in school was one of those. The fact that I taught math had a lot to do with why I chose that as the subject Jared was struggling with. QUESTION: Is Jared a real person, maybe one of your math students? DON: None of my characters are real people, although I often use details and traits from people I know to flesh them out. For example, I've taught a lot of people who, like Jared, are amazing on the basketball court but don't do well in school. I've also taught a lot of people who do well in school but not so well in sports—and, of course, I've taught people who do well in both. It's my job as a writer to create a character that readers will believe in, so I like to use details I notice about real people to do this. For example, for many years, all the rookies on my school's junior boys' basketball team shaved their heads, which is where I got the idea to have Jared and Steve shave their heads during the summer. Although Jared is a fictional person, someone I invented entirely from my imagination, readers often tell me they picture someone they know when they read about him. I think the strongest characters are those we can see in ourselves or in the people around us. QUESTION: Some readers might say you’re stereotyping when you create a female character who does well in math and a male character who struggles with it. How would you respond to people who say this? DON: First, I’d tell them to look at some of the other characters in One on One. Rafe Wells, who is male, does as well as Ellie in math, while Sasha Rivers, who is female, often does poorly in math, which is the reason her father takes away her cellphone. More important, though, I’d tell readers that a writer’s first job is to create three-dimensional characters, people who have both strengths and weaknesses. If I create a character who has only one or the other, then I’m definitely guilty of stereotyping—not to mention creating flat characters that no reader will believe in or care about. Ellie, who is strong in all her school subjects, has a problem relating to people her own age, while Jared, who is convinced he can’t do math, is a terrific athlete. Personally, I don’t see Jared as someone who can’t do math. As Ellie echoes Mr. Keaton in Chapter 25, “… everyone can do math. It’s just that some of us don’t have enough strategies.” As a former math teacher myself, I told my own students the same thing—many of them hit a brick wall when they used one strategy over and over without realizing there are many other ways to approach a math problem. The more strategies people have, the more likely they are to succeed in math, and Ellie helps Jared understand this, something he proves when he aces the math test he’d failed earlier. By the way, my main characters in my first two novels, Of Things Not Seen and Stranger at Bay, are both males, and both of them do very well in school. Jared just happened to be someone who struggles with math. QUESTION: I was surprised when Jared told Ellie what he dreamed of doing one day—becoming a marine biologist. Why did you choose that? Why not have Jared dream of playing professional basketball? DON: I like to think that people who are good at something don’t have to be defined by that one thing. I find it sad to think of people getting “slotted” into one role simply because they’re good at it. I think that people are so much more than just what they’re “good at.” Life is all about learning, about discovering new ideas, new interests, new possibilities. Unfortunately, though, I’ve seen some parents continually push their kids in one area because their kids demonstrated an ability or aptitude for it. Don’t get me wrong. I think it’s great when parents support their kids in a particular interest, but I’ve seen cases where parents have focused all their energy trying to make their sons or daughters into the next hockey or basketball or tennis phenomenon—every moment of their sons’ or daughters’ lives was spent pursuing that dream. In situations like this, I have to wonder whose dream is being pursued here—is it the kids’ or the parents’? Realistically, a very small percentage of these kids actually become that “next phenomenon”—the rest end up having to make other lives for themselves, but that can be really hard to do when you’ve focused for so long on only one thing. Although Jared loved basketball, I wanted him to be open to other possibilities. Jared will probably play basketball all his life because he loves it—maybe he’ll even share that passion by coaching kids like Mr. Jamieson does—but I like the fact that he’s able to imagine other possibilities for himself, even if they involve obstacles like math. One other reason I chose to have Jared show an interest in marine biology is that I wanted him to have something in common with Ellie, something that would allow him to understand that he and Ellie aren’t so different after all. Since it wasn’t realistic for Ellie, who had never before played on a team, to dream of a career in basketball, I had to find something else they could both be interested in. I chose marine biology because my younger daughter was interested in that at one time—when she was in junior high, my wife and I bought her an aquarium and she filled it with fish like the ones Ellie has. This is another example of my using details and traits from people I know to flesh out my characters. QUESTION: Did you play basketball when you were younger? DON: At the risk of alienating my readers, I have to confess that I’m not much of an athlete, something my daughters know only too well. In fact, they were surprised when I told them I was writing a book about basketball because I’m such a lousy basketball player. One of the most important pieces of writing advice that I give others is “Write about what you know.” But that doesn’t mean you can’t write about something you don’t know—you just have to learn about it first. For example, my third novel, The First Stone, is about someone involved in a car accident who must go through lengthy physical rehabilitation, but I knew nothing about those kinds of treatments so I had to do a lot of research on this topic, including visiting a rehabilitation centre and interviewing people who worked there. Even though I’m not much of a basketball player, both my daughters played on their school’s teams for several years, and I watched almost all of their games so I learned quite a lot about the sport from that. In addition, I asked the basketball coach at my school, Paul Shaffner, to read the parts of my manuscript that included basketball sequences to make sure I got the practices and the games right. It’s always helpful to have an expert check out your work. QUESTION: Where did Rafe come from? 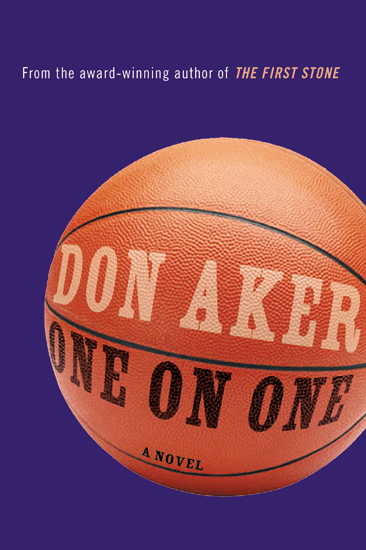 DON: As I was writing the novel, I realized that there had to be more to Jared’s situation than just overcoming his problem with math so he could play basketball. If that was the only problem he faced, I could have written the entire narrative as a short story. In order for that story to become a novel, I needed something else to complicate things for Jared. As I continued to write, I wondered if there might be someone else who didn’t get to play basketball because Jared made the team instead, and that’s when Rafe appeared. I knew I didn’t want Rafe to be someone the reader would feel sorry for if Jared got to play and Rafe didn’t, so I began thinking about what kind of person Rafe might be. Suddenly, Rafe’s backstory opened up in my head, a backstory that included a father who was running for election, and I saw how both father and son might be a lot alike. QUESTION: The fathers in One on One don’t appear to be very likeable. Rafe’s dad will do anything to win an election—even if it means ruining a teacher’s reputation—and Jared’s dad deserted his wife and son when Jared was four years old. Why did you present fathers in such a negative light? DON: I really hadn’t intended to do this. My own dad is a terrific father, and I’ve tried hard to be a good father to my own children. Parenting is one of the toughest jobs there is, and I always marvel at how no one can drive a vehicle on the highway without first passing a test, but anyone can have a child. Jared had a rough time with math because he didn’t have enough strategies to solve problems. Parents, too, need a variety of strategies when they face problems with their children, which is why I think parenting classes and parent support groups are excellent ideas. I also think that good parenting has less to do with biology and genetics and more to do with the kind of person you are. I think Terri St. George is a terrific mother because she’s essentially a good person—that business with DVD Guy shows us that. And although Mr. Keaton and Mr. Jamieson don’t have children of their own, they’re strong parental figures because they always focus on what’s best for the kids they teach. When my wife and I were expecting our first child, I read something that really struck me as important: “Don’t worry that your children never seem to listen to you. Worry that they’re always watching you.” I think that’s advice that every parent needs to remember. Unfortunately, it’s advice that Rafe’s father clearly ignored. QUESTION: All the main characters in your novels are males. Why don’t you write stories with female main characters? DON: Actually, I’ve written short stories that have female main characters, so females do make their way into my writing, but I agree that I’ve focused on males in my novels. This, of course, has a lot to do with my being male. Despite the fact that I’ve lived with my wife for many years and we have two daughters, I have a better sense of how males view the world than females. In my third novel, The First Stone, I actually planned for my main character to be female, but as I got further into writing the book, I found myself more interested in the male character’s backstory (he’s a young offender who nearly kills someone), and he eventually took over as my main character. The novel I’m working on right now has a female main character, and we'll see if she lasts. QUESTION: In your first novel, Of Things Not Seen, a wealthy classmate makes your main character—who comes from a very poor family—feel bad because of where he lives and how he dresses. In One on One, Jared feels bad because he and his mother can’t afford the expensive athletic wear and advantages that Rafe Wells has. It almost seems like you don’t like rich people. Is this true? DON: That’s an interesting observation. To be honest, I’m more concerned with how people treat others than with how much money they have. For instance, in Of Things Not Seen, my main character falls in love with a girl whose family has a lot of money—he loves her because of who she is, not because of what she has. But you raised an interesting point, which reflects how an author’s past experience can shape his writing. When I was growing up, my parents couldn’t afford to give my siblings and me some of the things many of our classmates had, and I remember sometimes feeling embarrassed about that, which may be why this idea creeps into some of my stories. Adolescents and young adults are often more concerned with what their peers think than with anything else in their lives. However, as an adult, I now know my parents always made sure I had the most important things, like unconditional love, a sense of pride in a job well done, and an appreciation for simple things that others sometimes take for granted. Those are the kinds of things I hope I’ve instilled in my own daughters. QUESTION: All your novels are realistic fiction. What attracts you to writing these kinds of stories? DON: It’s so much more difficult growing up in today’s world than it was when I was young—there are so many real-world problems facing young people now that I can’t help writing about them. Also, I like working with characters involved in real situations because I like figuring out how they will react, the kinds of choices they will make when faced with real-world decisions. Working with real-life situations allows me to consider how I might react and the kinds of decisions I might make. In a sense, writing realistic fiction enables me to “live” other kinds of lives. However, in 2005, the editor of Red Deer Press asked me to write a piece of short fiction for an anthology of horror stories—called The Horrors—that he was compiling for young adults. As a result, I wrote my very first horror story—called “Pull”—and I really enjoyed doing it. I’m certainly no Stephen King, but who knows? Maybe one day I’ll write a novel that isn’t realistic fiction.